Are you interested in giving a Senior Citizen or Veteran a ride to his or her medical appointment or grocery shopping? If so, this volunteer opportunity is perfect for you! Our volunteers give rides to individuals who cannot use other forms of transportation due to mobility issues. We do not transport wheelchairs. 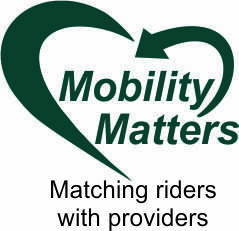 Mobility Matters is a nonprofit organization based in Lafayette, CA! "I have driven fascinating people from a number of different cultures... a wonderful experience." "I have met some very gracious people that make me feel good and positive about what I am doing." "A very rewarding and enriching experience. A positive feeling of making a difference in someone else's life." "Without the rides for Seniors program I would not be able to live in my own home. Thank you so much!" "Now that I am dependent on help, I appreciate all that is given and more. I consider myself very fortunate that service like this is available for us veterans and am greatly thankful and appreciate it very much." "I am retired Navy. Use the VA in Martinez a lot - very helpful. Mobility Matters is a Class Act!"